Soap | Is it vegan? Plant-based soap is available in Japan (look for the kanji for ‘plant’, 植物). Note however that palm oil is often used. It can be difficult to find a soap that was made without testing on animals. Cruelty-free Japanese products are not common and most companies appear to sell in China where animal testing is mandated by law. It’s probably safe to say most Japanese beauty products, including soaps, are made using animal testing. We will note below if any of the products are cruelty-free. The Japanese Anti-Vivisection Group (JAVA) publishes a Japanese guide to cosmetics companies that are cruelty-free and also cosmetics companies that are all-vegetarian (although not necessarily vegan). Find more information about it at the blog Cooking Vegan Around the World here. Below are some examples of 100% plant-based soaps, as well as some soaps that contain animal products. • Clover Additive Free Soap is made from 100% vegetable raw materials according to the Clover website (photo also from website). • Kao White Soap is made from 100% plant-based materials (although this is palm oil from Malaysia) – see the Kao website (photo also from website). The Konnyaku Shabon soap website’s about section states that their soaps are made of 100% plant-based ingredients and all handmade in Japan at a plant with 100 years of history. They can make 650 pieces of soap in one day. The soaps are made with water from Niigata, where the plant is located, and the fragrances are from essential oils. Each shop sells soaps with different fragrances, or you can order them all from the website. Shops are located in Hakodate and Otaru in Hokkaido, Atami in Shizuoka, Yokohama (two stores), Kamakura (three stores, including the main Japan shop), Tokyo (two stores), Kawagoe in Saitama, Kobe, Kyoto (two shops), and Naha City in Okinawa. Shop addresses are here. The soaps do not use petroleum preservatives, mineral oil, petroleum surfactants, synthetic fragrances, synthetic coloring agents, or petroleum ethanol. They do not use carryover components (components that do not need to be specified because they are at or below a certain amount). Children can also use these soaps. They use persimmon-derived mannan polysaccharides as a mild scrub. Polysaccharides are also used to make sure the gel soaps don’t melt and keep the same form until the very end. Lush is a very popular store in Japan with more than 150 branches in the country. It does not do animal testing or buy from suppliers that do animal testing and all the products are vegan or vegetarian. The bags say “no animal testing” in Japanese. It sells plant-based soap as well as facial masks, shampoo, conditioner and many other products. They also sell charity products, with the purchase price, minus tax, going to various charitable organizations both inside and outside of Japan. The company’s website states that about 80% of their products are vegan. Per Lush’s USA website, the company does use palm oil derivatives in some of its ingredients. The list of ingredients using palm oil derivatives is here. At least in the Shibuya, Tokyo branch most, but seemingly not all, of the products were labeled vegan or vegetarian, so it might be a good idea to look up the products you want before you go. They appear to specialize in highly scented/fragranced products. Per an article on plantbasednews.org as of March 16, 2019, Lush announced they will stop using eggs in their products and sell off the remaining stock of products containing this ingredient. However, some products will still use milk, honey, and lanolin. 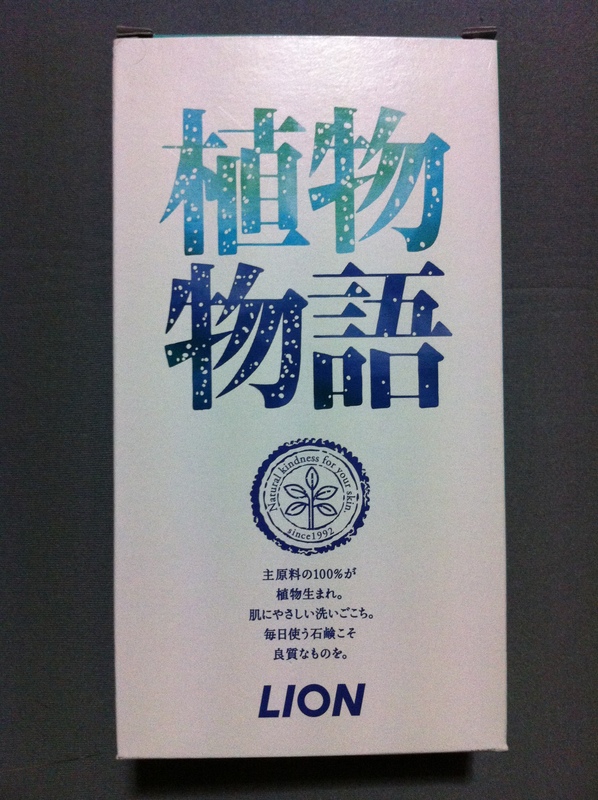 • Lion Shokubutsu-Monogatari (Plant Story) Herb Blend Beauty Soap. Ingredients: Soap foundation (100% vegetable based), palm fatty acid, fragrance, chamomile extract, etidronic acid, EDTA-2Na, water, ethanol, BG, titanium dioxide. Miyoshi is a company that makes a variety of solid and liquid body, baby, hand, and kitchen soaps, as well as shampoo and conditioner. Per a phone call as of January 2019, the only animal ingredient Miyoshi uses is beef tallow/gyuushi/ 牛脂. They only use beef tallow in some of their solid/固形 soaps or powder/粉 soaps, as well as other ingredients like palm oil. None of their liquid/液体 soaps contain any animal ingredients. Per the Q&A section of their website (Japanese), the liquid soaps are made of ingredients such as palm oil and rapeseed oil. However, a few of their liquid soaps do appear on their list of items containing beef tallow, so it seems their website has some inconsistencies. 1 We do not conduct animal experiments on any products. There are no plans to conduct animal experiments on any products at this time. 2 We do not assign animal testing of any products to an external organization. 3 We have not received any reports from group companies that they are conducting animal experiments. 4 We do not investigate whether or not raw material manufacturers are conducting animal experiments on raw materials used by us. There are no plans to investigate at this time. 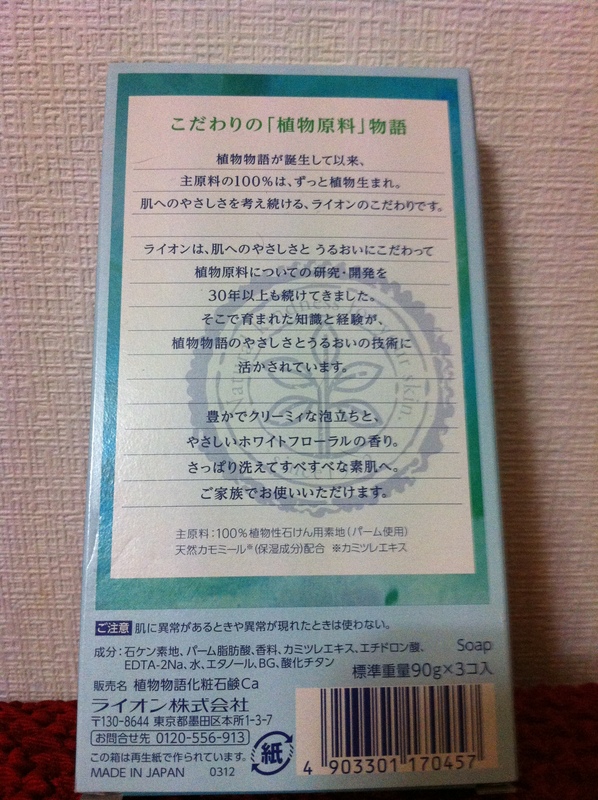 • Miyoshi Additive Free Foaming Body Soap Refill/Miyoshi 無添加せっけん泡のボディソープ. Ingredients: Water, potash soap base. • Miyoshi Additive-Free Foam Cleansing Soap/Miyoshi 無添加 泡の洗顔せっけん. Ingredients: Water, potash soap base. Weakly alkaline soap makes it easy to gently remove old skin. A 180ml refill is also sold for this product (pictured on the right). • Miyoshi Additive-Free High-Quality Foam Cleansing Soap/Miyoshi 無添加 泡の洗顔せっけん 素材こだわり. Ingredients: Water, potash soap base. High-quality soap made from macadamia and coconut oils moisturizes the skin. A 180ml refill is also sold for this product (pictured on the right). • Miyoshi Additive-Free Foam Hand Soap/Miyoshi 無添加せっけん泡のハンドソープ. Ingredients: Water, potash soap base. Easy to use. Recommended for children who don’t like lathering with traditional soap. Leaves no residue when washing hands. Refills are also available in 220ml and 300ml sizes. Refill shown on right of photo. • Miyoshi Additive Free Face Soap Bars (2 pc. )/Miyoshi 無添加洗顔せっけん 固形. Ingredient: Soap base. This product is not vegan. 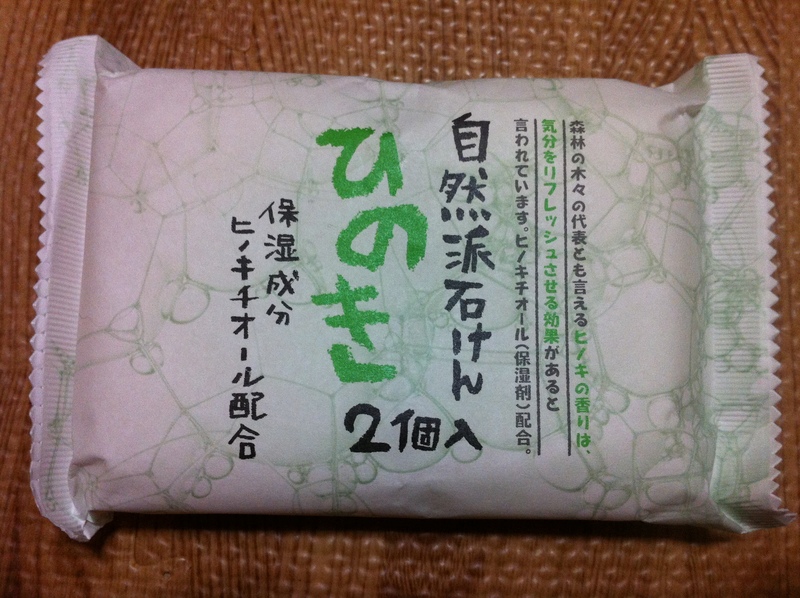 The Miyoshi website previously stated the raw materials of this bar soap are palm kernel oil and beef tallow. 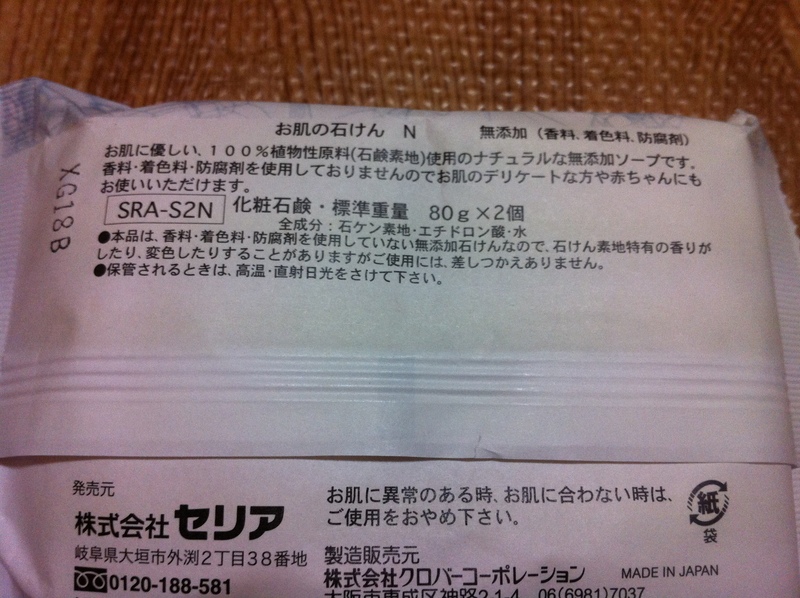 • Rosetto Additive-Free Facial Cleansing Soap/ロゼット無添加石けん洗顔フォーム. Ingredients: Water (purified water) · Myristic acid K (vegetable soap) · Glycerin (humectant) · Stearic acid (skin protecting agent) · K stearate (vegetable soap) · K laurate (vegetable soap). It’s been reported that this company says they don’t animal test, but they get ingredients from other companies and it is possible that those do animal testing, so the company can’t say they qualify as cruelty-free. Gentle 100% plant-derived cream soap. Creamy bubbles protect the skin’s moisture while properly removing dirt and old skin. Leaves no tight feel on the skin after rinsing. No fragrance, mineral oil, preservatives, coloring agents, petroleum surfactants, or silicone are used. Recommended for those with delicate skin. 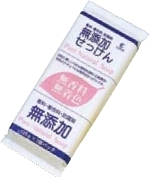 • Rosetto Additive-Free Rice Bran Facial Cleansing Foam/ロゼット 無添加米ぬか洗顔フォーム. Ingredients: Water (purified water) · Myristic acid K (vegetable soap) · Glycerin (humectant) · Stearic acid (skin protective agent) · K stearate (vegetable soap) · K laurate (vegetable soap) · rice bran extract (moisturizer). Moisturizing 100% plant-derived cream soap with rice bran extract. Creamy bubbles protect the skin’s moisture while properly removing dirt and old skin. Leaves no tight feel on the skin after rinsing. No fragrance, mineral oil, preservatives, coloring agents, petroleum surfactants, or silicone are used. Recommended for those with delicate skin. • Seria Additive Free Soap. Ingredients: Soap foundation (100% vegetable based), etidronic acid, water. • Seria Hinoki Soap. Ingredients: Soap foundation (100% vegetable based), hinoki oil (from Japanese cypress), glycyrrhizic acid 2K, cocamidopropyl betain, fragrance, PEG-75, etidronic acid, water, EDTA-4Na, iron oxide. Shabondama Sekken, meaning “soap bubble soap,” is a soap company whose website states that they do not test on animals. Some of their products are made by combining animal fats with vegetable fats and oils, and some with are made with vegetable fats and oils but no animal fats. 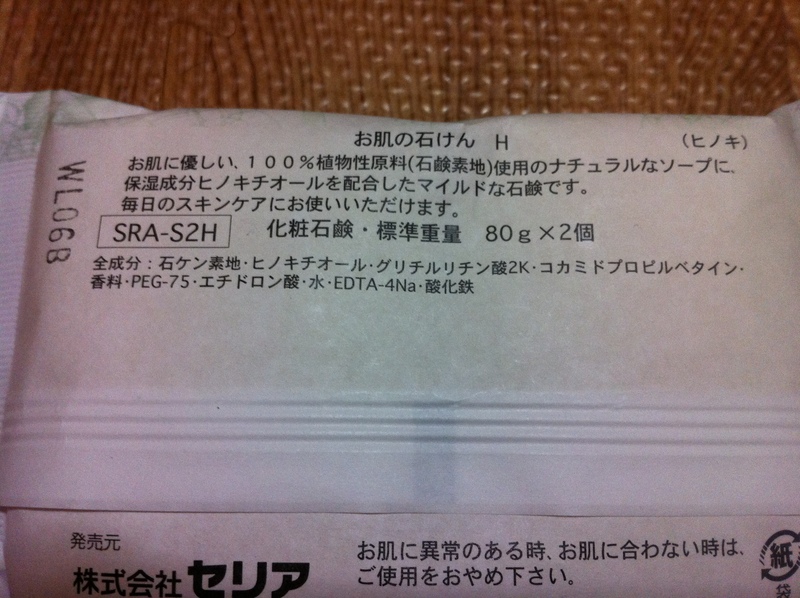 The full list of products they make without animal fats, including bar soap, facial soap, laundry detergent, and toothpaste can be found here (Japanese). A few products from the list are shown below. •Shabondama Soap’s Baby Soap (Solid Type)/ベビーソープ固形タイプ 100g. The sole ingredient is listed as soap base. • 純植物性シャボン玉浴用 100gShabondama Soap’s Pure Vegetable ‘Bubble Bath’ Body Soap/. The company website says the raw material is 100% vegetable oil (photos from website). Also comes in a larger “bath size” and a three-pack. • Shabondama Soap’s Olive Oil Facial Soap/シャボン玉　オリーブソープ（洗顔用）60g【泡立てネット付】　固形石けん. Ingredients: Soap base, olive oil. Contains certified organic olive oil as a moisturizing ingredient. Gentle to the skin. Will remove makeup if you wash with soap twice. No fragrances, colorants, antioxidants, synthetic surfactants. High-quality vegetable oil is used. A lathering net is included. Photo from website. • Shabondama Soap’s Additive-Free Bath Soap/無添加　シャボン玉　浴用 does not appear on their list of products that is made without animal fats. • Top Valu Soap is 100% plant-based. Top Valu is a brand sold at Aeon’s Max Valu supermarkets. • Cow Brand Beauty Soap is made from beef tallow and also contains milk ingredients. See the Cow Brand Soap Kyoshinsha website. • Pelican Soap appears to contain beef tallow. The ‘Factory Information’ on the company’s English website lists the raw ingredients as vegetable soap chips and ‘Soap chips with cow fat and palm tree oil’. The photo below is also from their website. • Reckitt Benckiser Muse Soap (ミューズ) is not vegan according to an email received from Reckitt Benckiser in late 2014. ・ Miyoshi’s Additive-free Solid Kitchen Soap/無添加台所用せっけん固型 is not vegan because it’s made with beef tallow, per the Miyoshi website Q&A (Japanese). ・ Miyoshi’s White Dish Soap/白いふきん洗い is not vegan because it’s made with beef tallow, per the Miyoshi website Q&A (Japanese). • Shabondama Soap’s Pure Vegetable ‘Sunol’/シャボン玉　純植物性スノール is made from vegetable fats, not animal fats. The sole ingredient is listed as “pure soap.” It contains palm oil. Fabric softener is unnecessary when using this product. Per their website, they don’t test on animals. Some of their other items do contain animal fats. Photo from website. 洗濯せっけん is additive-free and made from 100% vegetable fats which are cooked for more than one week until they become liquid. Synthetic surfactants, fluorescent whitening agents, fragrance, and coloring agents are not used. Per their website, they don’t test on animals. Some of their other items do contain animal fats. Fabric softener is unnecessary when using this product. Website states it can be used for “babies and seniors.” Good for fully automatic washing machines and drum type washing machines. Ingredient is listed as “pure soap.” A refill is available. Photos from website. ・Miyoshi’s Breeze 2.16 kg/そよ風2.16ｋｇ is not vegan because it’s made with beef tallow, per the Miyoshi website Q&A (Japanese). ・Miyoshi Marcel soap (3p, 5p)/ミヨシマルセルせっけん（3ｐ、5ｐ）for stains is not vegan because it’s made with beef tallow, per the Miyoshi website Q&A (Japanese). ・Miyoshi’s New Pure Soap/Ｎｅｗ純せっけん for collar, cuffs and spots is not vegan because it’s made with beef tallow, per the Miyoshi website Q&A (Japanese). 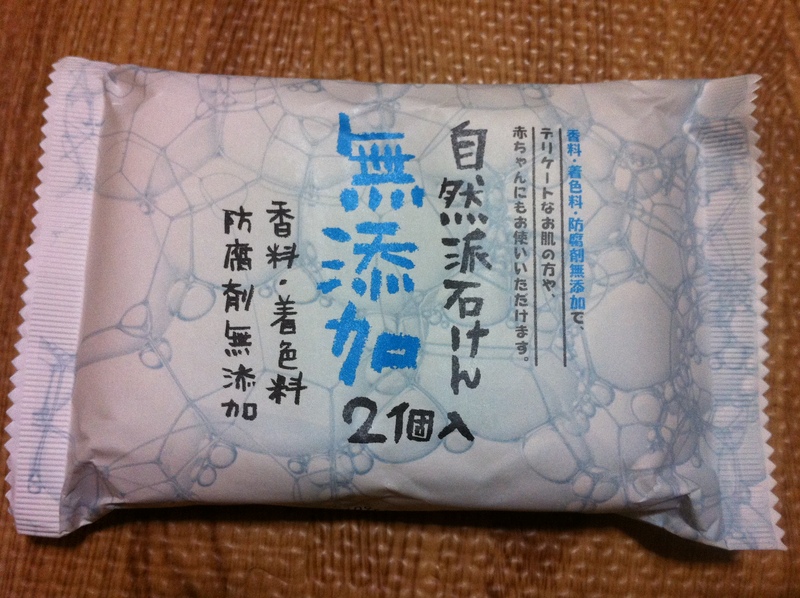 ・Miyoshi’s Powdered Laundry Detergent 3 kg/ミヨシのせっけん3ｋｇis not vegan because it’s made with beef tallow, per the Miyoshi website Q&A (Japanese). ・Diem Botanical Mouthwash/ディエム　ボタニカル　マウスウォッシュ and Diem Botanical Toothpaste/ディエム　ボタニカル トゥースペースト are made with no animal ingredients per their website, which says “no animal-derived ingredients” in English. No information is given about the company’s animal testing policy. ・Lush does not test on animals or buy from suppliers that test on animals. They sell toothy tabs/歯磨き用タブレット and mouthwash tabs/マウスウォッシュタブレット, small tablets of toothpaste or mouthwash. You can also look at the products in English on the Lush USA website. ・Shabondama, which does not do animal testing, states on their website that their toothpastes are made of vegetable fats, not animal fats, but it isn’t clear if all the ingredients in them are vegan. Please try LUSH and Shabondama, as neither test on animals and both have options without animal ingredients. We’ve added some information to the Soap section about these brands.